Twelve from this photo dropped out or were backsquaded. There were three potential Officers on this Platoon photo. I know Chris Budd made it but does anyone know what happened to the other two. They were Bob Drewery and Spencer Tracey and between them they had 30 GCE's. Bob soldiered with 'B' Company for a while but I cannot remember seeing Spencer in the Battalions. I recognise McCleod fourth from left front. 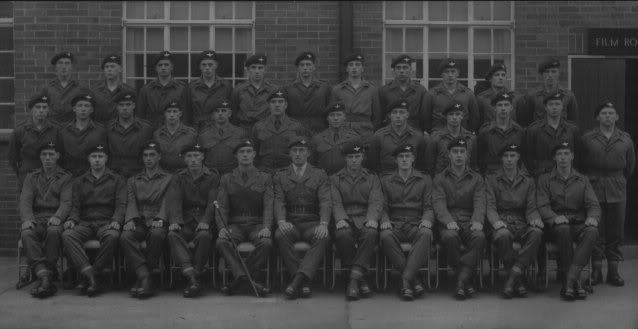 He went through with my platoon 274, We went to 2 Para July 64. lost touch with him soon after. I remember him keeping us awake late one night having a fight in the washroom with Brummy Copson. That was in Abingdon. He was a good lad, but always fighting after a few beers. I'm sure that's not the only face i recognise on that photo. I was told a long time ago that McCleod was no longer with us due to military operations.